Having to switch from one table to another could be a difficult task without the proper equipment necessary. A solid-built changing table is a good start, and the AM-SX1060 and AM-SX1072 are just the tables that are able to get the task done as needed. Both changing tables are a Hi-Lo variety, meaning they can be adjusted to just about any height. This is a plus for medical professionals who need to get a patient on the move quickly and efficiently. The height variety works for any situation and offers easy access to the patient from all angles. The top and sides are made with a 34-ounce, heavy duty, vinyl that can keep patients comfortable and secure from side-to-side. The frame is made with 11-gauge, heavy-duty steel. 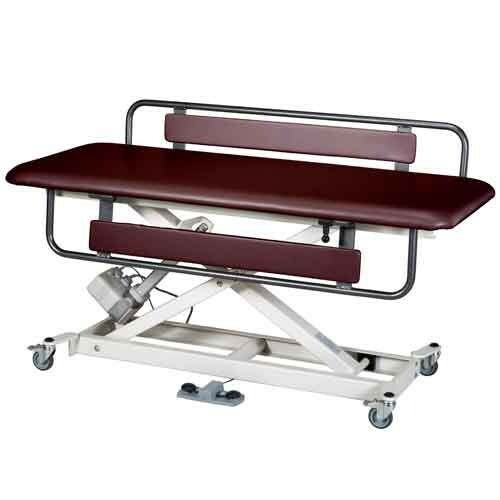 The table's lift system is motorized, giving physicians an easier way to lift and lower a patient for easier transfers. These types of changing tables can be used in any facility and they work well for people measuring 72 inches and taller.